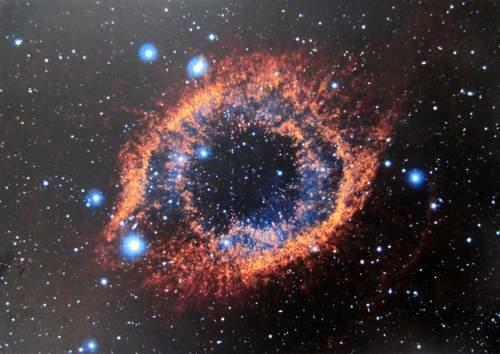 In this Astronomy Day 2016, we are showcasing postcard UA-1351038 from Ukraine that offers an unusual view of the Helix Nebula (螺旋星雲), NGC 7293, a composite image made from near-infrared photos using Y, J and K filters that were captured by European Southern Observatory's Visible and Infrared Survey Telescope for Astronomy in Chile. Located in the constellation Aquarius, it is often referred to as the "Eye of God" in pop culture. Astronomy Day, started in 1973, is an bi-annual event for the purpose of promoting interaction between the general public and various astronomy enthusiasts, groups and professionals. Initially, Astronomy Day occurs on a Saturday between mid-April and mid-May on or close to the first quarter Moon. Since 2007, an autumn rendition of Astronomy Day has been added to occur on a Saturday between mid-September and mid-October on or close to the first quarter Moon. Under such lunar influence, the events will happen on different dates each year, rather than on set calendar dates. The next date for Astronomy Day will be October 8, 2016.